Clicking on the selected item will take you to the item page. 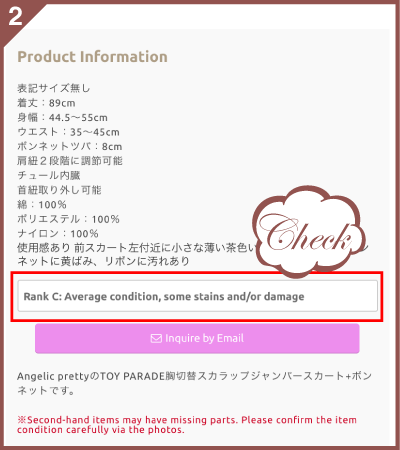 Once you are on the item page, please look at all photos carefully to confirm the item condition. 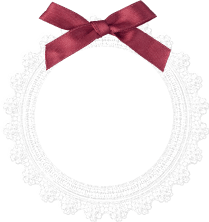 Sometimes items may be missing bows, waist ties or other small accessories. You will only receive what is pictured in the photos. Scroll down a bit to find information about the item on the right side of the page. Under “Product Information” you will find measurements as well as information regarding the materials used and the condition of the item. 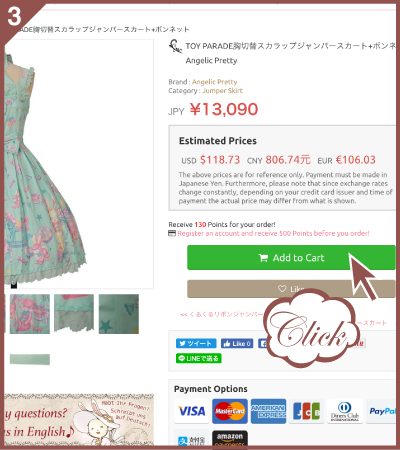 Depending on the item there may be further information in Japanese. Please either use an online translator or contact us via the contact form to learn more about the item. Please make sure to always include the item number when making inquiries. Click “add to cart” and you will be taken to your shopping cart. 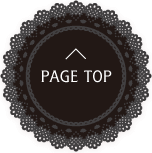 If you would like to continue shopping, click either “Wunderwelt Top” (to continue shopping for second- hand items) or “Wunderwelt Fleur Top” (to continue shopping for new items). If you are ready to place your order, click “Proceed to Checkout”. 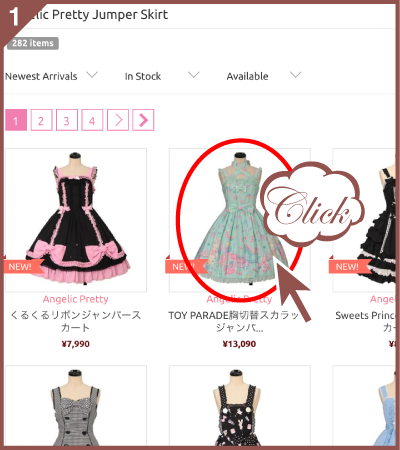 If you would like to delete an item from the cart, please click「×」on the left of the item picture . 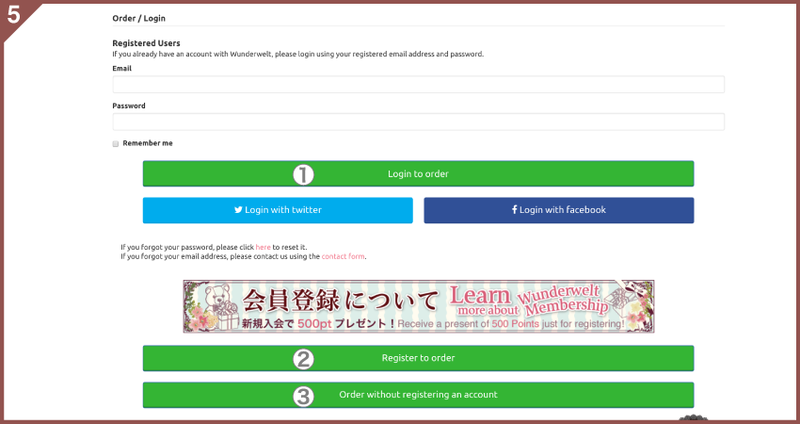 If you have a Wunderwelt account, put in your email address and password and click ① “Login to order”. If you would like to create an account, click ② “Register to order”. 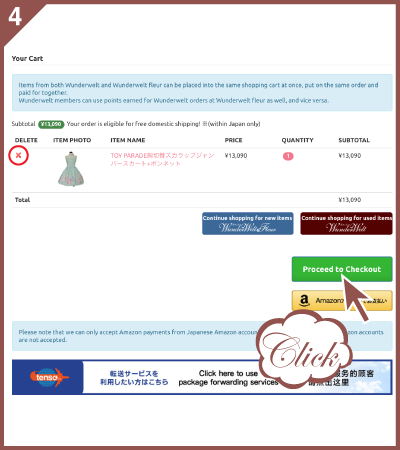 If you would like to order without an account, click ③ “Order without registering an account”. Enter your email address, name, shipping address and telephone number into the respective fields. You will not see this page if you already are a Wunderwelt member and are logged into your account. First, please select your preferred shipping method. Shipping cost is not included in the item price. You will be contacted regarding shipping cost after you placed your order. If you have coupons or Wunderwelt Points available, you can redeem them at this point. Please note that we cannot apply Points or redeem coupons for you afterwards, so make sure not to forget applying them yourself. 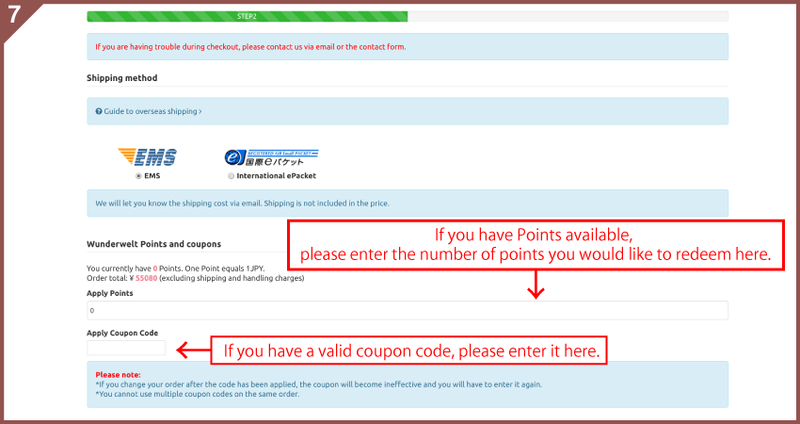 cannot apply Points or redeem coupons for you afterwards, so make sure not to forget applying them yourself. Next, please choose the language in which you would like to receive your order confirmation mail (English, Japanese or Chinese). Now please choose your payment method (credit card, PayPal or Alipay). If you chose credit card, please enter your card details. Please note: Payment via credit card is not accepted for orders using package forwarding services. Please choose payment via PayPal or Alipay. And lastly, if you have any requests, concerns or instructions please enter them into the Special Instructions field. Make sure you filled out everything correctly, and click “Review your order”. If you chose PayPal You will be taken to PayPal to complete your payment. If you chose credit card , you will be taken to the order confirmation page. 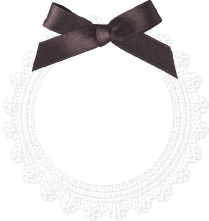 We cannot send orders marked as gifts. We cannot mark down the value of a package on the customs form. International orders can be shipped via EMS, International ePacket, with International ePacket being the cheapest method for smaller orders. To learn more about the different shipping methods please click here. ◆Delivery time and date cannot be specified. If everything is correct, please click “Place Order”. You should receive an automatic confirmation email. Please contact us if you do not receive such an email. There is no need to reply to the order confirmation mail unless you have questions or concerns. Congratulations! Your order is complete! In addition to our official homepage we run stores on various shopping sites. you ordered may already have been sold on another site (although this is very rare). In this case we will contact you via email, and your order may be canceled. ◆After receiving your order confirmation mail, our staff will calculate the shipping cost for your order. 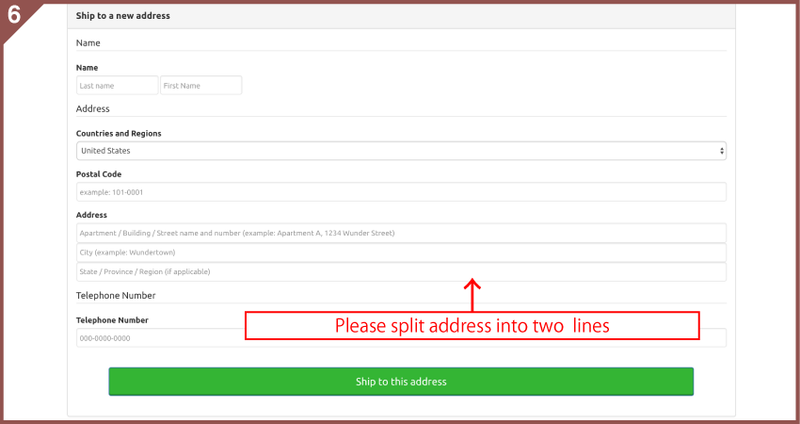 If you chose PayPal as your payment method, you will receive an invoice for the shipping cost. If you chose credit card, please follow the link attached to the email and place an order for postage from our website, just like you would order an item. In general, your order will be shipped within two business days after we have confirmed full payment of both item and shipping cost. Once your order has been shipped out, you will receive a tracking number via email with which you can check the status of your package. If you need your order before a certain date, please make sure to order well in advance. We have no control over how fast the post office and your country’s customs office handle you package. We cannot guarantee that an item arrives before a certain date under any circumstances.